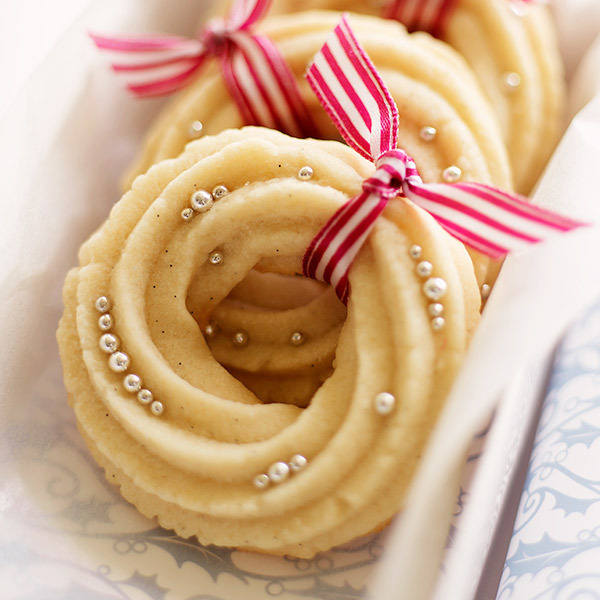 Find a simple recipe for Danish Butter Cookies plus instructions on how to shape and decorate them as Christmas wreaths. Add a ribbon to each for a cute edible gift. In a large bowl, with an electric mixer, combine the flour and butter, and mix until coarse crumbs form. Spoon the dough into a pastry bag fitted with a ½-inch star tip. Pipe a length of dough 4 inches long. Transfer to the baking sheet and form into a circle, gently pinching the ends together. Place the circles about 1 inch apart. Sprinkle with the dragées. Bake for 8 to 10 minutes, until firm and just golden around the edges.